Accommodation in 3 star Budget hotels with all the amenities. Minimum 2 Person. 01 Dbi Rooms. All transfer by Ac Vehicle (Ex Ahmedabad). All applicable hotel vehicle taxes. Driver allowance, fuel charges toll taxes. Today, proceed to Jamnagar via Rajkot. Rest at Rajkot. On arrival at Jamnagar check in the hotel. In the evening visit Bala Hanuman Temple know for its non stop ramdhun since 1956 and it mentioned in Guinness Book of World Records. Overnight stay at the Hotel. Today, proceed to Dwarka. On arrival visit Dwarksdeesh Temple. Later, take a trip to Bet Dwarka. Visit the old Temple of Krishna. On the way to Bet Dwarka, visit Nageshwar Temple-One of the 12th Jyotilingam of Shiva, visit an ancient Temple of Rukmini, Return back to Dwarka. Overnight stay at the hotel. Today, proceed to Somnath on route visiting the famous Harshad Mata's Temple situated on top of a hillock. Proceed to Somnath. 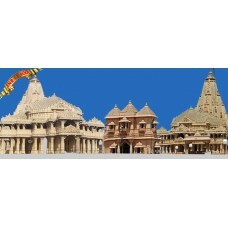 On arrival visit the Somnath Temple & Bhalka Tirth. Witness aarti, Light and sound show. Overnight stay at the hotel. Today, proceed to Ahmedabad. Visit Local Sight Seeing. Gandhi Ashram-Kankariya Lake. Overnight stay at the hotel. Today, proceed to Gandhinagar. Visit Akshardham Temple. Arrive at the Ahmedabad. Per person rates (in Rs. )-applicable for 2 person staying together, sharing the same room. The Package does not include guide services. These can be availed at an additional coast. Package rates are subject to charge without any prior notice. CP - Accommodation with breakfast. EaseMyTrip.com reserves the right to change/modify or terminate the offer any time at its own discription and without any prior notice.